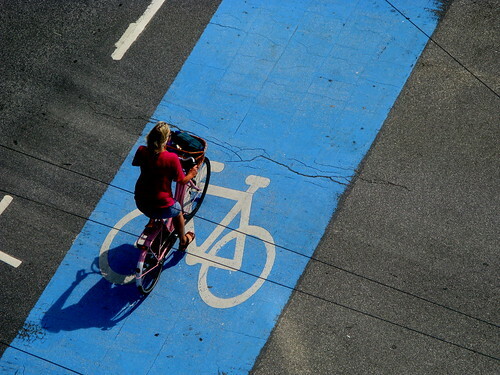 The blue, blue bike lanes of Copenhagen go with any colour. 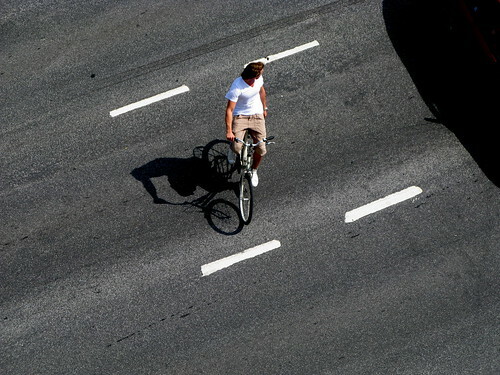 He's not part of the traffic. He IS the traffic. I'm curious...I'll assume its a fine in Copenhagen if a automobile trespasses into the bike lane..if so how much is the fine? Thoughts on this matter? What's a good place to put the lanes then? Especially in N.American cities where taking away the parking altogether would only result in anger and protests? william: bikes are equal members of the traffic. there are fines for cars, just as their are fines for bikes doing the wrong thing. usually between 250 and 500 kroner. 25-50 pounds. it's all rarely enforced. no bell? fined. no reflectors on your wheels? fined. and so on. cars and the pavement and they're usually wide enough to allow for doors. this design is the most popular and it is proven to be the safest. 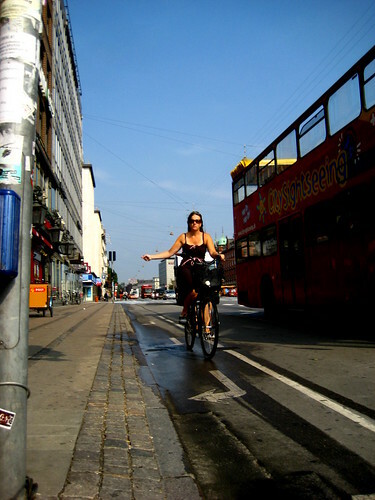 often there is a car door zone between the car and the bike lane, in places where the bike lane is narrower. protests about removing parking? we've been there. 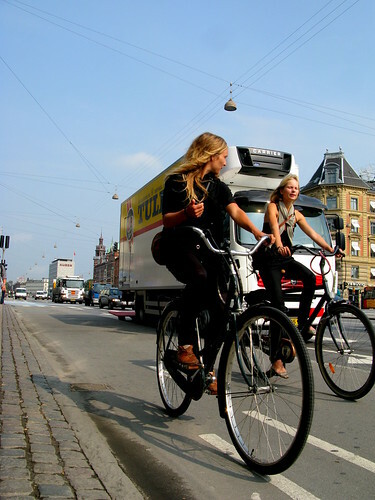 it was tough when copenhagen really started developing our bike lane network in the 1980's - loads of protests - but people soon realise that more bikes means less car traffic - good for both parties, less road maintenence due to less usage and shops enjoy more profit when there are more cyclists.